Terminal Reality are actually making the "main" Ghostbusters game. Sierra got them the rights to it. Bill Murray's involved, Harold Ramis is involved, and so is a lot of money, hope and expectations. That's a lot of stuff. So who's the glue holding the whole project together? 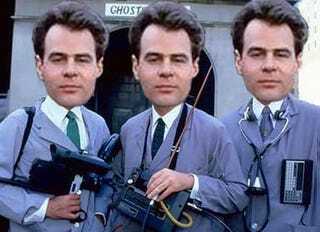 Why, Dan Ackroyd, of course. Seems Ray Stanz has done more than just help write the game: he was "a really big facilitator" in getting guys like Murray and Ramis onboard in the first place, and is - get this - even helping the design team come up with the names for the Ghostbuster's new equipment, characters, etc. Say what you will of Ackroyd's recent career (or lack thereof), it's still nice to see a Hollywood name do more for his appearance in a game than just record a few hours of dialogue, take the cheque and run.